Partners In Printing offers all printing requirements including digital printing, multi-color presses and all other commercial printing capabilities, including finishing mailing capabilities. You will surely find us a helpful PARTNER for all your printing needs whether it is Brochures, Catalogs, Newsletters, Postcards, Presentation Folders, or Books and Manuals. Don’t waste time making multiple calls from one vendor to another. 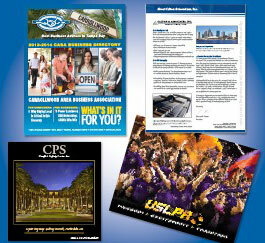 Take advantage of our 25 years of experience with all facets of the Commercial Printing industry. We take the hassles out of finding a supplier for all stages of your Commercial Print project. We are your single source solution!